The term “Personal Information” means information about an individual who is a Member and includes any “Supplemental Personal Information,” as defined further below, that we obtain. We use your Personal Information for providing and improving the Service. By using our services, you agree to the collection and use of information in accordance with this policy. At MyFEDBenefits, we recognize that privacy of your personal information is important. Here is information on what types of personal information we receive and collect when you use and visit our websites including but not limited to https://myfedbenefitshelp.com/, and how we safeguard your information. We never sell your personal information to third parties. We collect this information for the purpose of providing the Service, identifying and communicating with you, responding to your requests/inquiries, servicing any purchases you make and improving our services. To promote use, including continued use, of our Services. For example, if you leave your personal information when you visit our Website and do not sign up for any of our services or programs, we may send you one or more emails asking whether you wish to sign up. If you use any of our Services, and may benefit from using one or more other Services we offer, we may send you an email telling you about the other Service or Services. For internal use, whether in the form actually received or pseudonymously or anonymously, by way of example and not limitation circulating email addresses internally for identifying the most common web hosts used by our customers, or reviewing IP addresses for information about the general geographic areas of origin of our users. To disclose the information that we have to you in response to any valid request from you to know what of your information we possess, and in response to a valid request to exercise your “right to be forgotten” as detailed further below. The right to request access to and to receive your personal information that is collected by MyFEDBenefits. The right to request updates to any of your personal information that is inaccurate or incomplete. The right to erase your personal information such as when the information is no longer necessary in relation to the purposes for which it was collected or processed. The right to obtain the restriction of the processing undertaken by us on your personal information in certain circumstances, such as where the accuracy of the personal information is contested by you, for a period enabling us to verify the accuracy of that personal information. The right to object on grounds relating to your particular situation, to the processing of your personal information, and to object to processing of your personal information for direct marketing purposes, to the extent it is related to such direct marketing. If you wish to prevent cookies being set before you visit this website, or most other websites, you can set your browser to block cookies. Most browsers allow you to do this in their settings. You can also visit www.allaboutcookies.org for details on how to delete or reject cookies and for further information on cookies in general. On our website we use the marketing and remarketing services of Google LLC (1600 Amphitheatre Parkway, Mountain View, CA 94043, USA; “Google”). These services allow us to display advertisements in a more targeted manner in order to present advertisements of interest to users. Through remarketing ads and products are displayed to users relating to an interest established by activity on other websites within the Google Network. For these purposes, a code is used by Google when our website is accessed and what are referred to as (re)marketing tags are incorporated into the website. With their help, an individual cookie, i.e. a small file, is stored on the user’s device (comparable technologies may also be used instead of cookies). Cookies can be set by various domains, including google.com, doubleclick.net, invitemedia.com, admeld.com, googlesyndication.com or googleadservices.com. This file records which apps users have visited, which content they are interested in and which offers have been used. In addition, technical information about the browser and operating system, referring websites, the length of the visit as well as any additional data about the use of the online products and services are stored. The IP address of users is also recorded, although we would like inform you that within the framework of Google Analytics, IP addresses within Member States of the European Union or in other contracting states to the Agreement on the European Economic Area are truncated. One of the Google marketing services we use is the online advertising program Google AdWords. In the case of Google AdWords, each AdWords customer receives a different conversion cookie. Cookies can therefore not be tracked through the websites of AdWords customers. The information collected by the cookie is used to generate conversion statistics for AdWords customers who have opted for conversion tracking. AdWords customers see the total number of users who clicked on their ad and were redirected to a page with a conversion tracking tag. The legal basis for the use of this service is Art. 6 paragraph 1 sentence 1 letter f GDPR. If you wish to object to interest-based advertising by Google marketing services, you can do so using the settings and opt-out options provided by Google: http://www.google.com/ads/preferences. This allows user behavior to be tracked after they have been redirected to the provider’s website by clicking on a Facebook ad. This enables us to measure the effectiveness of Facebook ads for statistical and market research purposes. The data collected in this way is anonymous to us, i.e. we do not see the personal data of individual users. However, this data is stored and processed by Facebook, which is why we are informing you, based on our knowledge of the situation. Facebook may link this information to your Facebook account and also use it for its own promotional purposes, in accordance with Facebook’s Data Usage Policy https://www.facebook.com/about/privacy/. You can allow Facebook and its partners to place ads on and off Facebook. A cookie may also be stored on your computer for these purposes. The legal basis for the use of this service is Art. 6 paragraph 1 sentence 1 letter f GDPR. You can object to the collection of your data by Facebook pixel, or to the use of your data for the purpose of displaying Facebook ads by contacting the following address: https://www.facebook.com/settings?tab=ads. Facebook is certified under the Privacy Shield Agreement and thus guarantees compliance with European data protection legislation (https://www.privacyshield.gov/participant?id=a2zt0000000GnywAAC&status=Active). On our website, we use the Conversion Tracking Service of Twitter Inc. (1355 Market Street #900, San Francisco, California 94103, “Twitter”). Twitter stores a cookie on the user’s computer to enable an analysis of the use of our online products and services. Twitter Conversion Tracking tracks the actions of users after they have viewed ads or interacted with ads on Twitter. Twitter’s Conversion Tracking allows you to assign conversions such as link clicks, retweets or “like” data. The legal basis for the use of this service is Art. 6 paragraph 1 sentence 1 letter f GDPR. If you wish to object to tracking, you can do so using the Digital Advertising Alliance tool at optout.aboutads.info. We use services and content provided by third parties on our website (hereinafter collectively referred to as “content”). For this kind of integration, it is technically necessary to process your IP address so that the content can be sent to your browser. Your IP address will therefore be transmitted to the respective third party provider. In each case, this data processing is carried out to safeguard our legitimate interests in the optimization and the commercial operations of our website, the legal basis of which is Art. 6 paragraph 1 sentence 1 letter f GDPR. The Java programming language is regularly used to integrate content. Therefore, you can object to data processing by deactivating Java operations in your browser. Google is certified under the Privacy Shield Agreement and thus guarantees compliance with European data protection legislation (https://www.privacyshield.gov/participant?id=a2zt000000001L5AAI&status=Active). To the extent that our Website contains links to sites operated by third parties and not related to our products or services (“Linked Websites”), the Linked Websites are not controlled by us and we are not responsible for the privacy practices of those companies. Before disclosing your personal information to Linked Websites, we advise you to examine their privacy policies. DISCLAIMER: Google, Facebook, Twitter, LinkedIn, Youtube nor any other brand mentioned on our site(s) endorse or sponsor this site(s) and are in no way affiliated with MyFEDBenefits. DISCLAIMER: MyFEDBenefits is not affiliated with, endorsed or sponsored by the Federal Government or any U.S. Government agency. All members of the MyFEDBenefits advisor network are licensed independent financial services practitioners and are not employed by MyFEDBenefits. Subscribe now to get the latest federal retirement news delivered straight to your inbox! NOTE: Please make sure to check your email and click the link to confirm your subscription. 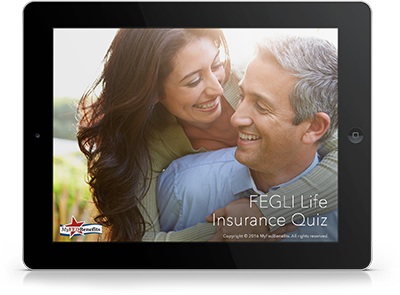 Determine if FEGLI is right for you by taking our quiz. Should Retirees with FEHB Enroll in Medicare Part D?